And somewhere at the corners of the road when the leaves rustle, I run to my window with the hope to see you knocking the door. Leaves, Autumns, and Aprils! How the three of these connected the dots of our life together. 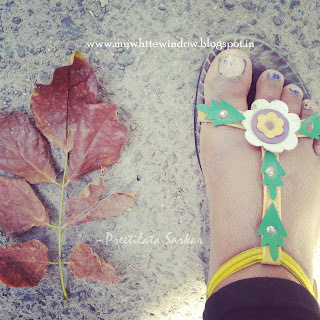 How over a heap of fallen leaves you taught me to find April in the midst of barren autumn. It’s been twelve years since I ran away from my so called home. As my mother breathed her last I gathered every bit of my breath to run for my life. Even though I had nothing left with me, not even the leftovers of hope...still I wanted to have a life of my own. A yearning for a home where there was no existence of selfish discord of my very own father, took me to places and at last to You. I was born in the month of April. No one remembered the date. As someone rightly said, why to remember the dates that are ominous enough for generations to come. I was born a girl, enough for my father to despise me to death. Added was the curse of my partial blindness. Sometimes I wonder what did they do when they discovered that I am to be found no where? Or did they at all search for me? What would have happen to me had I not taken the decision to run away? Clueless and aimless, I decided just to run...only to meet you at the very end of the world. Can you hear her playing the piano? Her fingers fall like feather on the keys and move like a humming bird’s wings. And as she sings the very song that you used to sing for me, drops of honey sprinkle around. Dad! Did you again catch the tears in my eyes? I am sorry but I do cry when I miss you. Out of sadness, out of happiness and out of everything you are to me, yes! I do cry. Remember! When sitting on that heap of fallen leaves while you wiped my tears away, I promised you to never cry again? But some promises are meant to be broken while the love lasts forever. I was no one to you. I did not even have a name. Back home I was just a nameless object devoid of everything that made me a human. The ways the world run is uncanny and beyond my understanding. There are people who do not value their own child just because she is a girl and at the same time there are people who do not think twice before adopting a homeless girl child. Even my partial blindness could not deter you from giving me an eternal place in your heart. It’s 6th of April again dad! Come, wish me Happy Birthday. Come, hold me close to your chest Dad and rock me to sleep. The lemon cheesecake that I have made today lacks the dust of your wrinkled sun-burned hands. Twelve years ago on this very day, holding my li’l hand you took me to the country church. As the Father sprinkled the holy water on me, dear dad, do you remember how your heart got filled with pride, love and hope? I was finally commemorated with a name. April! That’s what you named your darling daughter. That day you broke your promise too to never cry again. Some promises are meant to be broken. Did not I always tell you this? Come, hold my feeble yet strong hands once more dad and let’s go to the church again. Let us pray together for one more beautiful year ahead. Dad! See, I have got few wrinkles too! Just like yours, line after line, they tell stories too. And how amazing is that! Dad! I wish you were here today to see your darling grand-daughter sing for you. It is the same song that you used to sing to me in remembrance of your wife. Dad, I never told you this but even in her absence I have always felt her motherly presence on the skin of my soul. I have never seen her but I have known her through your songs and stories. Dad, thank you for giving me a Mother too. Dagny right now has completely immersed herself. No! This time I am not going to hide my tears anymore. I will let them to fall down. Let her see how precious her grandpa is for her mom. This time I will join her and will sing my heart out. Dad! Can you hear your April singing? The sun-burned hands, I used to hold. P.S: The Song is Autumn Leaves by Eric Clapton. You write beautifully.very very beautifully ! The emotions are so well portrayed so well expressed ! Such a beautiful story....heart wrenching......well done. Such a touching story. Sometimes it is not the one who gave life but a stranger who becomes everything for us. Loved the stories you weaved through the string of words. A father-daughter relationship is special in its own way but it becomes even more so, in this case where they start as strangers. You're back with a bang! Came from A to Z.
good lck and R U AN Aprilite :) ? Lovely introspective writing. The memories...the loss...the hope all part and parcel of life. Oh this made me feel quite sad and it reminded me of my dear dad. Nicely written. Hi dear. This is really a good piece of writing and I am glad you continue blogging. Visual and emotion connect each other so well that I could emphatize and feel. At one point I am thinking, are you really the girl potray in this post? This is so heartfelt, and I can relate to this in a weird sort of way. Lovely presentation Preeti! Truly impressive story and you deserve writer status. Hope to see u coming up with more warmth post. Beautiful, Preetilata. Thank you for a wonderful story. Love the song! That is such a powerful story!! Well done! V well written.... leaves me with a catch in throat! Beautiful writing - I am looking forward to reading the rest of you A - Z posts! I would have sworn it's your story...but no....its an imaginary story of a girl for real....Wonderfuly exposed .Hugs.